Indian Super League (ISL), Season 5, is here and the excitement levels amongst the fans have been sky high. The advent of ISL has been quite a high for Indian sports. The current season, ISL 2018-19, is scheduled to stretch for over six months, starting September 29. It will be former champions Atletico Kolkata (ATK) vs Kerala Blasters FC in the season opener. If you are looking for fixtures of Indian Super League 2018-19, then you can download the PDF of time-table of ISL 2018-19, below. INDIAN SUPER LEAGUE 2018 Schedule in PDF Free Download. The tournament will see a total of 10 teams participating to lay their hands on the glorious ISL 2018-19 trophy. The teams participating in the tournament are Atletico Kolkata, Bengaluru FC, Chennaiyin FC, Delhi Dynamos FC, FC Goa, Jamshedpur FC, Kerala Blasters FC, Mumbai City FC, NorthEast United FC, and FC Pune City. ATK vs Kerala Blasters, ISL 2018–19 Live Streaming Online: How to Get Indian Super League 5 Live Telecast on TV & Free Football Score Updates in Indian Time? Atlético de Kolkata vs Kerala Blasters will kick off the Indian Super League 2018-19 season. Spanish playmaker Manuel Lanzarote will be skipper of the Kolkata-based football club after his move from FC Goa. ATK have been able to retain quite a few good players, and their squad looks pretty impressive once again and will look to overcome the disappointments of last season under new manager Steve Coppell. Defending champions Chennaiyin FC’s first game of the competition is against Sunil Chetri’s Bengaluru FC which boasts of some of the biggest names of Indian football like Gurpreet Sandhu and Harmanjot Khabra. The match makes up for a super Sunday in the Indian Super League. ISL 2018–19: List of Top 5 Foreign Players to Watch Out for in the Indian Super League Season 5. The biggest talking point in this year’s ISL has been the arrival of Australian legend Time Cahill at Jamshedpur Fc. The veteran will bring his wealth of experience in the league and the young crop of players at the new entrants Jamshedpur will certainly learn a lot. They are in action for the first time away at Mumbai on the 2nd of October against perineal underachievers Mumbai Fc. Head coach Jorge Costa has overseen an excellent preparation camp in Thailand and will be hoping his Mumbai lads finally come good in the ISL. North East United FC and FC Goa lock horns on October 1st while the Delhi Dynamos are at home to the Pune City FC on October 3 to mark the opening exchanges of the Indian Super League. 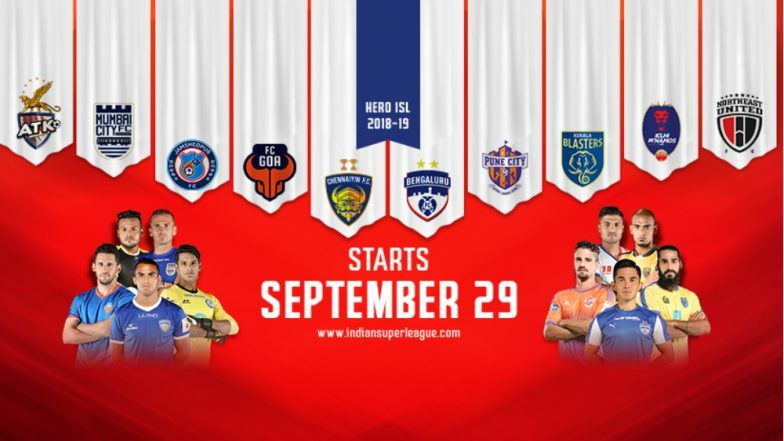 ISL 2018–19 Live Streaming and Telecast Details: When and Where to Watch Indian Super League Season 5 Matches on TV or Online on Hotstar & JioTV App. The format of the Indian Super League is such that the ten teams play each other on a home and away basis with the top four teams making it to the playoffs. In the playoffs, the top team plays the fourth-ranked side while the second and third-placed team meet once again on a home and away format to book a place in the coveted final. Hence, the only consideration for the coaches throughout the league stage is to make it to the playoffs. Once you are in the playoff, anyone can be beaten provided it is your day. The ten team tournament has been a revelation of sorts in Indian football and with each passing season, the level of the game has significantly risen. The league has done a lot to bring India on the football globe of the world giving a chance to both young and experienced home talents to share the dressing room with International stars who bring a lot of learning with them. The agenda at the end of the day is to nurture football at the grassroots level for the ISL through its franchisee clubs.